RHINO steel buildings aren’t one-size-fits-all. We offer multiple steel wall panel options and different types of metal roofs, so you can choose what works for you. RHINO’s standard metal building wall panels are 26-gauge, high-tensile steel Purlin Bearing Rib (PBR) panels. 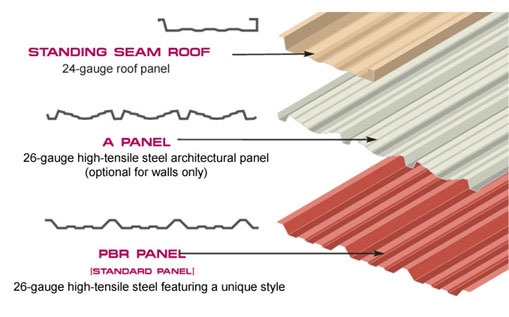 PBR steel building wall panels are incredibly durable, featuring an extra overlap for increased strength and water resistance. These steel panels are coated with Galvalume®, which provides weather protection and comes with a 30-year warranty. You can then choose from eight color options to layer over the Galvalume®. When other companies choose steel panels for buildings, they usually use ordinary “R” panels. These have a shorter overlap, which produces less metal-to-metal contact for a weaker connection. Choose RHINO for the strongest, most water resistant steel building wall panels in the industry. Another steel building wall panel option is Cool-Coated panels. Cool-Coated metal building wall panels are ideal for anyone who want to save on energy bills. These panels reflect 40-50% of the heat away from the building, keeping the interior cooler and saving 7-15% on cooling bills. Cool-Coated panels are the most efficient steel panels for buildings, and come with a choice of 16 roof panel colors and 12 wall panel colors. RHINO offers near endless customization options, including canopy configurations that can change the profile of your roofline. RHINO can add 2’-10’ canopies to sidewalls with soffit or 3’-10’ canopies on end walls. Door canopy kits are also an option and can be configured to fit 30”, 40”, and 60” wide door openings. Utilizing canopy configurations is a great way to make your metal building your own. A practical addition to any RHINO building, gutters and downspouts can be ordered in colors to match the metal building wall panels, different types of metal roofs, or the contrasting trim color of your new building. This is another great way to protect and waterproof your metal building by channeling excess water away from the building and foundation. You can extend the life of your steel building roof with proper ventilation. 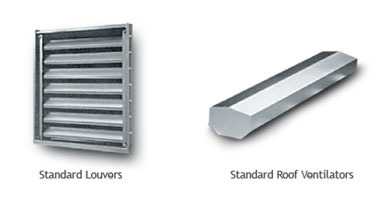 Louvered vents or ridge vents minimize the temperature differences between the roof cavity and the outside air, which helps remove moisture. Trapped moisture not only reduces the R-value of the insulation, but it also causes condensation problems, so proper ventilation is key. Call RHINO to discuss our different types of metal roofs, steel wall panel options, and customization features. Speak with a metal building specialist at 940.383.9566 today. Share the post "Exterior Options"